The Ohio State Buckeyes struggled in defending the option against the Midshipmen of Navy and it showed in Baltimore before the fourth quarter as Ohio State used some big plays to stun Navy on offense and defense in a 34-17 win. The Buckeyes controlled the fourth quarter,but for three quarters,Navy stood toe to toe with Ohio State and battled them evenly. J.T.Barrett threw for 226 yards and two touchdowns,including a 80 yard strike to Devin Smith while OSU used a committee ground game to rush for 194 yards on the day. The biggest defensive play came in the third quarter when Joey Bosa wiped out Navy quarterback Keenan Reynolds as he pitched the ball errantly to have Darron Lee scoop and run for a 61 yard touchdown on the fumble recovery. 1) So what did I think of J.T. Barrett? I liked much of what I saw. Now he is not Braxton Miller,but few are. 2) Barrett will be a work in progress,but his deep ball to Devin Smith was perfectly thrown and I was more impressed by his arm than I thought I would be. 3) That didn't mean he was blameless as his first half interception was all on him. Barrett eluded the rush and threw into coverage that he shouldn't have. Barrett will avoid making that pass with time and experience. 4) Urban Meyer used a couple of different backs,but the one that stood out to me most was Curtis Samuel,who ran hard and played physically. 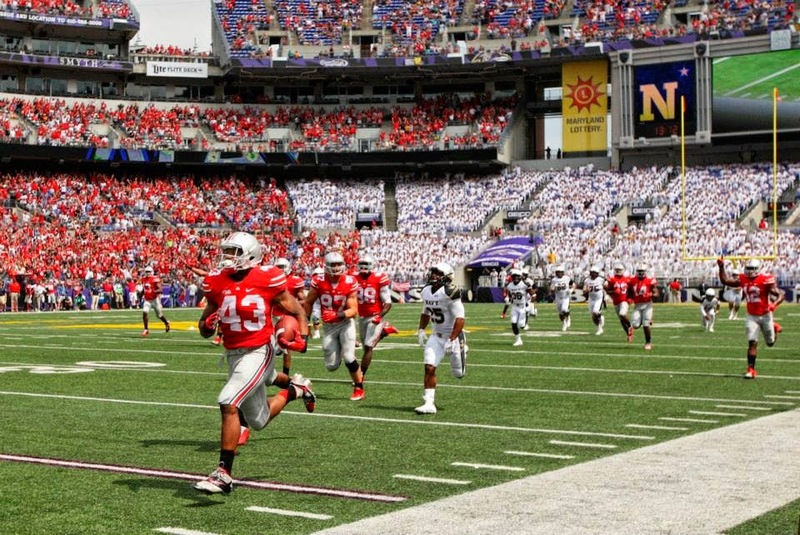 I'd like to see more of Samuel against Virginia Tech..
5) Meyer's play calling wasn't the best in this one. Until the second half,the Buckeyes kept things close to the vest and didn't allow J.T. Barrett to make plays. 6) Liked what I saw from linebacker Darron Lee,who not only scored a touchdown,but seemed to be all over the football. 7) Super day for the Buckeye defensive line,especially Adolphus Washington,who played very well. Wait until Noah Spence gets back for what might then be the best line in the nation. 8) Still the team was plagued by poor tackling,especially in the back seven. 9) I've always liked Verne Lundquist,but age might be catching up with him as he seemed behind the game and often puzzled. Hope this is just first game jitters for Lundquist and he picks his game back up. 10) Loved the sportsmanship by both teams after the game as both teams went to the others end to sing their fight songs. Great stuff and what college football should be. 11) Give Navy credit for hanging tough,they deserve it,but play this game in midseason and I bet it isn't that close. The 2014 Ohio State Buckeyes were considered to be the top candidate from the Big Ten to reach the first ever Final Four for football,but circumstances to Braxton Miller's shoulder changed that,but this still should be a fun Buckeye team to watch this season. With Miller gone for the season,redshirt freshman J.T. Barrett will man the controls of the Buckeye offense. While Barrett has a ton to prove,he was highly thought of entering OSU and once he gets his sea legs a bit,will be more than adequate as Miller's replacement. Cardale Jones will see plenty of time behind Barrett,especially during the non-conference schedule and the underrated Jones might even push Barrett if the situation fell a certain way. Running back looks to be a group of talented runners that will wait for one to break out. Ezekiel Elliott had the edge going into the season,but Rod Smith and Curtis Samuel closed the gap and will get their chance to carry the ball. I've always liked Brionte Dunn and hope he will find an opportunity as well. At H-back,exciting sophomore Dontre Wilson returns and will give Barrett a top notch weapon to use. Freshman Jalin Marshall is another star in the making behind Wilson. The wide receivers start two seniors,but the experience drops off considerably after that. Devin Smith and Evan Spencer are both quality pass catchers with Smith being a big play guy downfield.Junior Corey Smith adds experience behind the starters,but sophomore Michael Thomas and freshman Noah Brown will need to mature quickly to contribute. Jeff Heuerman returns at tight end to give the Buckeyes a huge target over the middle and backup Nick Vannett is even larger than Heuerman and adds a beefy blocker to the line in short yardage spots. Heuerman is underrated as a pass catcher,so perhaps the senior could be more involved in the passing game this season. The offensive line may take some time to jell after losing four starters,but there are still some experienced players that are now getting a chance to start at least at tackle with senior Darryl Baldwin and junior Taylor Decker manning the outside spot. Junior Jacoby Boren has been in a tight battle with Alabama transfer Chad Lindsay at center,so either could be the winner and both could see lots of early time to determine the winner. The guards are younger with soph Pat Efflien at one spot and surprising freshman Billy Price has bullied his way into a starting spot. The defense was disappointing last season,especially against the pass,where Clemson shredded the Buckeyes in the Orange Bowl. Chris Ash was brought in from Arkansas to help Luke Fickell revitalize the defensive bunch that badly needed a turnaround. The defensive line is the clear strength of the squad with three super players in defensive tackles Michael Bennett and Adolphus Washington along with defensive Joey Bosa. All should be All-Big Ten contenders and when Noah Spence,who might be the best of the bunch, returns from a suspension,the line should wreak all sorts of fire and brimstone in the league. Junior Tommy Schutt will see lots of time in the the interior rotation and would start on just about any team in the country,while senior Steve Miller will start at the other end until Spence returns..
Curtis Grant returns as the only linebacker from last years group to lead that corp.
Senior Doran Grant leads the secondary that has to step their game up from last year,if the Buckeyes are going to make a title run. Two freshmen will see time at the other corner as Eli Apple and Gareon Conley are splitting time for now. One would think eventually one will establish himself at the position. Vonn Bell showed me some good signs last year,but he is fighting off fellow soph Cam Burrows at one safety with sophomore Tyvos Powell at the other safety. Junior Armani Reeves will see lots of playing time in multiple DB situations. If this group cannot step up its game,the Buckeyes will have severe defensive problems again. Cameron Johnston is back after a very good freshman year as a punter,while freshman Sean Nuernberger will get the first shot as the placekicker. Now what do I think about this years Buckeyes. With Braxton Miller,I would have said,they run the table and make the playoffs. Without,I'm going to say they lose one game that they might not have with Miller and add that to a loss to Michigan State in East Lansing. The PPM returns and with a new official hostess as well. I decided that each year will bring a new face,so welcome LPGA star Jessica Korda to the PPM after ESPN's Heather Cox was the face of the PPM last season. The college picks will expand this season with the return of Boise State and adding Washington with the hiring of Chris Petersen from Boise State. I will be skipping Bowling Green and Boise State this week as both played before this writing. 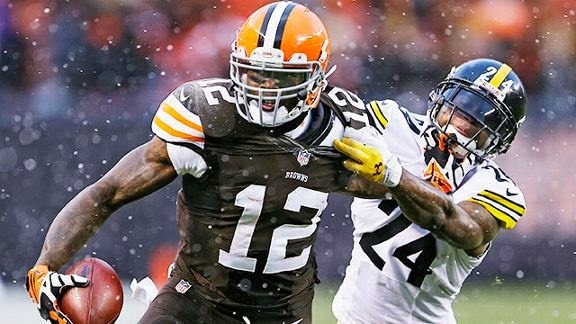 The Cleveland Browns received a crippling blow to any hopes of improvement for the 2014 season as the NFL upheld the one year suspension of Josh Gordon leaving the Browns precariously light at the wide receiver position. First,let me address this-I'm in favor of a little bit of nuance. When you consider that you take two samples for a drug test,one labeled A-the other B and A tested a hair over the limit,B was even further under the limit,so had B been labeled A,the test would not have even been positive,so that screams for a little bit of discretion. Taking that in account,there should have been some gray area for a punishment that addressed the issue,yet considered the situation,for example a four to eight game suspension would have been palatable to me. This really makes the league look bad with a year for a person that was around marijuana (I believe Gordon wasn't smoking,if he was he would have failed other tests and failed by a far more substantial margin) yet just two games for Ray Rice pounding his girlfriend in a public place and who know what minor slap Jim Irsay will get for his driving under a controlled substance situation? Most likely,Irsay will give a tear-filled apology,pay a fine and write a check to a charity and we still have the Steelers LeVeon Bell and LeGarrette Blount for their Ridgemont Highesque pot possession pickup to contend with. The Browns are culpable here as well as they knew that this could be coming and still refused to select a pass catcher in the draft. Sammy Watkins would have made this far easier to swallow,but we now have to wait and see where the first rounder that the Browns obtained from Buffalo rates a year from now,while the 2014 Browns rely on Miles Austin (brilliant,but brittle),Andrew Hawkins,Nate Burleson and who knows what else for Brian Hoyer/Johnny Manziel to throw to. If the Bills stink like the Browns could,Cleveland should be able to add two elite players next year,but might not help Mike Pettine any and since Pettine wasn't anyone's guy to begin with-don't be stunned if the Browns hire their 3rd coach in 3 years at the conclusion of the season. And even though I'm sympathetic to the situation,I still blame Josh Gordon for being around pot. He had to know that the league was gunning for him and he still (at best) put himself in a bad situation. For that part,I hold Gordon accountable. Roger Goodell is an awful commissioner in a sports world filled with them and in my opinion,Goodell dropped the ball again. We return to the Forgotten Superstars universe with one of my favorite players and perhaps my favorite Pirate of the last 30 years. Andy Van Slyke was one of the premier defensive outfielders of his time and swung an underrated bat as well. Van Slyke was originally a Cardinal and had just middling offensive numbers with base stealing being his lone plus stat until he was traded to the Pirates in the Tony Pena trade. Pena was one of the best offensive catchers in the game at the time and it was considered quite a coup for the Cardinals to land him considering the price of Van Slyke,who although was solid,the Cardinals had an excess of fleet outfielders that were pluses defensively,Mike LaValliere and Mike Dunne. All of three of the players obtained in the deal by Pittsburgh would contribute to the three Pirate division champion teams in the early 90's,but none more than Van Slyke,who began to mature as an offensive player . Van Slyke hit Pittsburgh in 1987 with a vengeance as he notched career highs in average,homers,doubles,triples,homers,RBI and steals in an attempt to show the Cardinals what they had traded away. 1988 was even better as Van Slyke would post the highest homer total of his career with 25 homers and 100 RBI as he made the All-Star team along with winning the Gold Glove and Silver Sluggers awards. Van Slyke struggled through a poor 1989 before rebounding with excellent seasons for the three division winners from 1990-92 and was off to a great 1993 as he made the All-Star team before an injury that ended his season and never really returned as the same offensive player. Van Slyke's stats dropped off badly in 1994 and he attempted to start a new portion of his career in 199,but in 80 games with the Orioles and Phillies,it was clear that his days were numbered and he retired at the end of the season. Van Slyke was a tremendous defender as he flew across the artificial turf fields of the day with tons of leaping over the wall catches and skin scraping dives which not only made him a top notch defensive star,but a huge fan favorite not only in Pittsburgh,but across the country. The hustle that Van Slyke played with made him popular,but likely shortened his career crashing around the concrete pool tables that the National League players played on back then. Van Slyke also possessed one of the games better throwing arms as he played right field for the Cardinals before moving to his better known center with the Buccos. Van Slyke built a reputation as a gunner with double digit assists in his final two Cardinal seasons and first two years in Pittsburgh,so runners rarely tried to take the extra base on Van Slyke. Van Slyke was outspoken and sometimes that got him into trouble with fans and teammates and it was well known that he and Barry Bonds did not get along well with the Pirates. There is always the famous story on the Sid Bream play that Van Slyke told Bonds to move in on Francisco Cabrera and Bonds responded with a one finger answer! You know how that play ended! We welcome Andy Van Slyke to the Forgotten Superstars universe and remember his all out playing style with the fondest of memories! 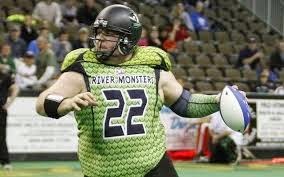 On Saturday,I read an ESPN article on Jared Lorenzen,the former Kentucky star quarterback,who had a cup of coffee in the NFL and earned a Super Bowl ring with the Giants. The struggles of Lorenzen hit home and I'd like to share with you the struggles,problems and yes-fears that I struggle with every day. The author of the article clearly is a big man himself and his concerns also strike home although some of the things that have happened to him have never happened to me,that doesn't mean that they couldn't. 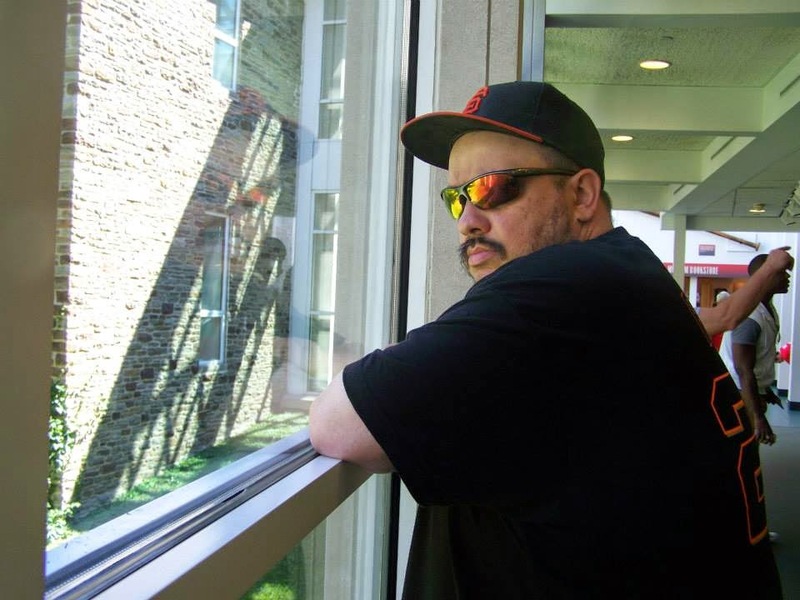 The author wears 6XL shirts to fit him and even though those size shirts are way too big for me,they are quite comfortable just as 5XL are larger than I need. I've always wore shirts that were multiple sizes up even in the days of wearing a 2xl when I was a XL,so that part isn't because I'm fat,it is because I hate shirts that are even my size,let alone tight. He also talks about chairs collapsing under him,(never to me) and other things that normal sized people take for granted,but for the most part that hasn't happened to me. He also talks about devouring entire boxes of snack cakes and things like that,but with one notable exception that Cherie and I know not to buy except on a rare occasion,I've never had issues with that either,so some of these things even I just don't get. The one thing that I do relate to his eating frozen foods and items like that. We have stuff like that here,but we try to mix things up with other "healthier" items when we can,but finances can come into play. My main issue is a love for anything fixed using a potato,but there is many "bad" foods that I don't eat often. Not an huge ice cream eater,not a big bread person (except for sandwiches) and not really a huge baked goods fan either,although those Hostess fruit pies (Cherry or Lemon) are awesome,but at the calories shot,I bet haven't had one of them in years! We do try to have snacks that aren't calorie killers,I like fresh veggies and will wipe a jar of Claussen pickles out pretty fast,but still once you are a big man,it takes more fuel to keep the machine running. I still don't think I eat as much as one would think and I can generally go through a ball game without having to eat unless it's a long road trip day,but obviously there still is a problem somewhere. I don't drink alcohol and I don't drink full calorie soda. I stick to diet or 7up 10 (Thanks,Mike) and I do drink lots of water,so I suppose things could get far worse,if I drank caloried drinks. I try to "do" more,but it becomes tougher as the body breaks down and ages. I suppose that becomes a self-fulfilling prophecy,but before this season I never really noticed anything. I was still able to do most of what others did for years,but I have noticed some difficulty keeping up this year. The long graphing days have taken more of a toll on me this year than in the past and the sun takes more out of me than in previous campaigns. That tells me that I need to do more,but it's tough. I sleep terribly,partially because of working third shift,but even on "regular" evenings,I don't sleep well. I've thought about adding things to make that improvement,but have not been able to do that yet. You have be who you are and the truth is the truth,although I'm well aware of what I am,that doesn't mean I want to be reminded of it anymore than someone wants to be reminded of having an alcohol problem,problems with women, etc.. It may not hurt you to the point of getting upset all the time,but it still doesn't feel great and tends to put a damper on a mood pretty quickly. All and all though,I don't consider that a huge problem. I also have concerns about medications. I see my friends dropping weight using pills and I wonder about that because it seems to help at the same time,I don't want to get used to taking medication for this issue. I've thought about beginning to take sleeping pills to help me sleep better and the positive affects that better sleep could give me,but again I have concerns in starting something that I may not be able to stop. Every day is the day that the "comeback" is going to start and sometimes they last more than others,but in the end-I haven't been able to get the job done. That's on me,no matter what the reasons or excuses are (some are legitimate and others are trying to tell myself what I want to hear"-the bottom line or scale doesn't lie. But the most poignant and scary thing was and is this-I'll quote the author. "We see our futures and they're not long ones. I'm 50 and I might feel it more deeply than he (Lorenzen) does. Nobody who's 65 looks like we do"
Finally! Kevin Love officially becomes a Cavalier! The worst kept secret in sports finally was made official as the Cleveland Cavaliers landed one of the top players in the game as Kevin Love was acquired from Minnesota as part of a three team deal that included the Philadelphia 76ers. The cost to land a player of Love's skills was high as both of the last two first overall picks were shipped to the Timberwolves as both Andrew Wiggins and Anthony Bennett are Minnesota bound with the Miami first rounder in 2015 that the Cavaliers added in the sign and trade for LeBron James when his talents were taken to South Beach. Minnesota then took that pick and sent it to Philadelphia for Thaddeus Young. 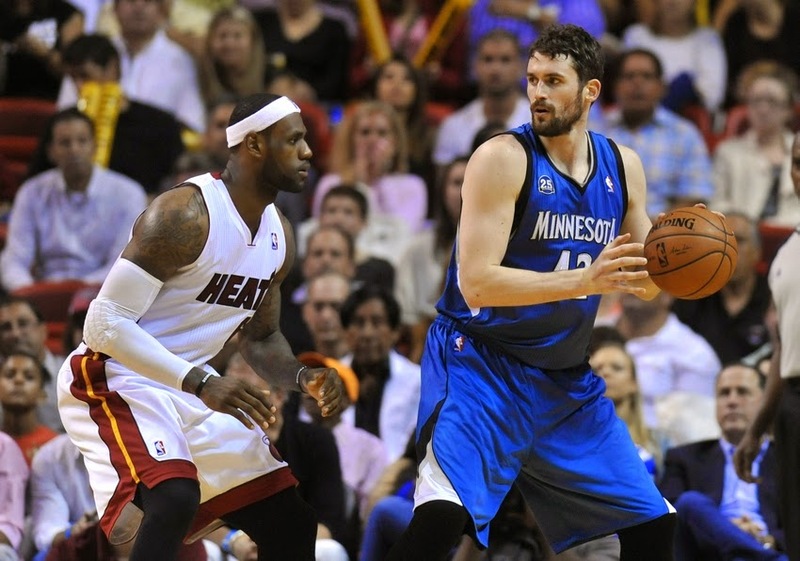 Kevin Love is going to fit very well with the game of LeBron James with his ability to hit the boards and go outside to pop the three pointer,so I don't foresee the growing pains that James had with Dwyane Wade with two players that needed to learn to play with a star teammate that needed to have the ball in his hands as much as the other. Love knows the game and I think the learning curve will be slender for Love,James and the remainder of the Cavaliers. Love instantly upgrades the rebounding part of the team,but doesn't address the rim protector that the team still needs and might lack the chips to bring one in trade. Honestly,the only deal that I could think of that might work would be with the Pistons for Greg Monroe,who might be available in the right deal as he would be a free agent at the end of the next season. It would likely take Dion Waiters and maybe a little something extra,but that could be something the Cavaliers might look into. I'm disappointed to lose Andrew Wiggins. Really disappointed because I think he is going to be a huge star in the league for a long time,but Kevin Love isn't exactly a aging veteran at 25,so Cleveland can't be criticized for going for the short term only. I think Anthony Bennett will be better than he showed in Cleveland,but I wouldn't let Bennett stand in the way of this deal. As long as Cleveland is able to sign Love to a long term extension,I'm reluctantly OK with the trade and only reluctant because I am that high on Andrew Wiggins. The problem that I have is that the Cavaliers might have been able to wait and maybe avoid trading Wiggins in mid-season. That would at least have given the Cavaliers time to see just how Wiggins game fits with LeBron James and Kyrie Irving and see how that works out. In the event that Love decides to hit the free agent market at the end of this season (word is that an extension has already been agreed to),then I am not as pleased and under those conditions,I would not approve of the trade. The Cavaliers are now the likely favorite to win the Eastern Conference,but there still are holes. The aforementioned rim protector is one,but another is a veteran point guard that is capable of starting yet is able to accept backing up Kyrie Irving. The injury history of Irving makes a solid backup for him a mandatory addition..
Now that the off season is over,we have a better idea on what the Cavaliers will look like and I like what I see,although there still is a little work to do. Now it's just a waiting game until October-I can't wait to see if that elusive title is finally going to arrive! Return of the Top Five! It's a slow night and since I used the last three ideas that were given to me for slow nights. I figured this was a nice time to list the top five cards that I'd like to own,but don't. These may not be the most expensive card of a player,but it is the one that I'd like to own the most. I also kept the list to one card of a particular player in order to diversify. Also keep in mind that since I completed the 1971 set,that took a lot of cool cards off the table too! The 1962 set is not my favorite set of the 1960's,that honor goes to 1965,which might be my really long term project that might last me until the day that I shuffle off to the stadium above or below,but the 1962 Koufax is my favorite card of mainstream Koufax's. Crisp,clean and sharp,1962 is clearly my favorite Koufax card! One of my favorite pitchers of my youth ( I favored lefties despite being a righthanded thrower),Carlton doesn't have this card to himself as he shares it with the immortal Fritz Ackley and his Cardinals cap is airbrushed awkwardly in the typical Topps airbrush job,but it is the rookie and as noted,my favorite set of the 1960's. Allen was another long time favorite,who went through a succession of boring cards from 1969-1972 with the exception of the 71. In fact all of those cards feature Allen in profile and all look like they were taken at the same photo session. Since I have the cool 70's cards of Allen,the 1965 gets the nod over the 1964 rookie that Allen shares with another "rookie star". A card that I would think that I should have,but I don't. The 1972 Clemente is a card that must have fallen through the cracks and wouldn't cost me a mint to land. The Peter Max 1972 design has grown on me through the years and the Clemente shot of him juggling a baseball is a neat touch as well. I actually have this card,but it is so beaten and dilapidated that I could use an improved card. I think I've told the story of this card before,if not,let me know and I'll tell it sometime. 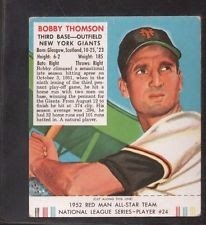 The best card of Thomson as a Giant and the first card to mention the Shot Heard Round the World. I'll do another one of these for football sometime soon! Looks like we just might have a shot at baseball in Hagerstown after all. Of Course,when you consider the do nothing mayor and his city council,I wouldn't want to bet on Hagerstown doing anything with a potential opportunity,but suddenly Diamond Nation wants an 18 million dollar handout from our good friends in Fredericksburg to fill an "unanticipated" cost overrun. As in the difference of the original 35 million to the now needed 53 million. These things usually happen when you have these type of massive projects,but I've thought from day one that the Diamond Nation part of the project was built on a foundation of sand and suddenly a project that would "pay for itself" is shortly followed by a request for funds. I would not say that baseball in Hagerstown is looking good for the long term (vote the bums out in 2016! 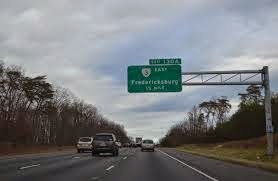 ),but Fredericksburg is looking shakier by the day with their various delays in purchasing the land,Diamond Nation's hey buddy can you spare a dime bumming and the citizens there beginning to turn on the project. Meanwhile for Suns owner Bruce Quinn,he has to wonder what his move would be if Fredericksburg balks at the cash request. Owning a team that is hemorrhaging money ( my guess is that the Suns will lose at least a million dollars this season,if not two million) after attendance sunk lower by the announcement that the team was leaving,higher expenses to play at and maintain the Muni for the 2015 season and now with the possibility of the Bahamas of the Mid-Atlantic bailing out combined with the South Atlantic League not allowing him to move south of the Virginia state line,Quinn could be facing a dearth of suitors and a upcoming cash crunch that could see him reevaluating just how much he wants to stay in the baseball business. Which brings us to the dream scenario to keep the team in Hagerstown. First,Fredericksburg and/or Diamond Nation has to walk. Whether Fredericksburg throws in the towel like Winchester did or Diamond Nation realizes that this won't be the revenue flood that they expected once they have to pay their own way,one of those HAS to happen in order for this scenario to occur. Next,Bruce Quinn may have to sell the team. Quinn's name is poison here in Hagerstown and anything done to keep baseball here (new stadium or not) will not occur as long as the people that run the city will have to deal with Bruce Quinn. If Fredericksburg cannot get off the ground and have things at least started,Quinn will be stuck in a spot of having to continue to play in Hagerstown. With having to deal with the limited area of which to move the team to and with so many teams controlling their 50 mile radius,the team may have no choice,but to stay for a spell. 2016 also brings elections for mayor and city council and with the right results-Goodbye to Dave Gysberts as mayor and especially Kristin (let's build a youth sports complex in a town with 50 little league baseball and soccer fields already here) Aleshire and Penny Nigh off the city council,perhaps some forward thinking candidates could sit down with Bruce Quinn or however and figure out a way to get this thing done! The Cleveland Browns and new head coach Mike Pettine have made their decision,for now at least and selected Brian Hoyer as the starter for the team entering their season opener at Pittsburgh two weeks from Sunday. 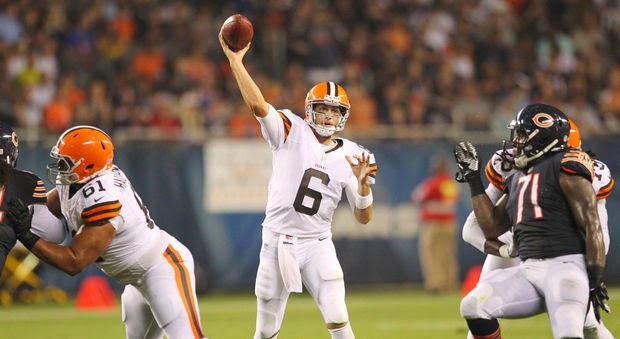 Hoyer was given the starting job over first round draftee Johnny Manziel after a pre-season that saw neither candidate exactly distinguish themselves in their first two games of the exhibition season. Watching the two games makes me wonder what the hurry was to make the selection when you consider the less than championship level that both guys played at,but usually teams play their starters for the majority of the third game of the pre-season slate,so that was likely the reason for making the call now. There are legitimate cases to make for both Hoyer and Manziel getting the starting job. Manziel because of his first round selection and ability to make plays on a team that could have zero playmakers at wide receivers if Josh Gordon is suspended. Adding everything,I agree with Pettine's decision to go with Brian Hoyer for now and emphasis on the words for now. My reasoning is this- If you start Hoyer and he plays poorly,you then have a slow start most likely and have nothing to lose by playing Manziel. Starting Manziel first and he stumbles and you have to bench the player that has been drafted to be the star of the team in his first action. It's better for the Browns to let Hoyer start and see what happens. That allows Manziel to learn and in the event that he sees the field,he should be better prepared to handle the speed of the game. The experience of Hoyer (as limited as that is) gives the Browns the best chance to win right now in a season that starts with the Steelers,Saints and Ravens before the bye and then if say the Browns are 0-3 entering the bye week,the Browns have that week to get Manziel up to speed and then 13 games to see just what "Johnny Football" has to offer. If you start Manziel and he goes 0-3.,the fans will be groaning as you go back to Hoyer. QB Quandary in Ohio- Part I- Braxton Miller out for season! Braxton Miller's shoulder injury not only ended a run at the Heisman Trophy,but may have ended the hopes for Ohio State to make the first ever college football playoffs. Miller did announce plans to attend graduate school and apply for a medical redshirt which will allow him to return for a senior season in 2015. Now that any question of Miller's return later in the season is off the table and that everyone knows that the 2015 Buckeyes will be Miller's team,the big question is how this loss will affect the 2014 squad. A lot and yet a little. J.T, Barrett enters the Buckeye corral high on the saddle a year earlier than expected,but Barrett was a highly touted recruit out of Texas,so this isn't exactly Joe Bauserman II that we will be seeing in Columbus. Barrett runs and throws well,at least that's been reported anyway,although expecting him to be Braxton Miller's equal as an athlete is asking a lot. Barrett will have to learn on the job and there will be some learning to do especially with an offensive line in the midst of retooling,however I have some hope. The second game against Virginia Tech won't be an easy one,but the game is in Columbus and the Hokies are not quite what they were when the game was scheduled,so that one could be one that the team slips by with. Cincinnati two weeks later might not be easy either,but then the schedule lightens as Barrett gains experience. Penn State,despite their restrictions,won't be easy under the circumstances under James Franklin and the biggest game on the schedule (talent wise) is on the road in East Lansing against Michigan State. The michigan game is at home and the Buckeyes gain from that,but by that time,Barrett will not really a freshman at all. The loss of Braxton Miller likely means the Buckeyes will lose a game,maybe even two that they would not have with him,but the overall difference is likely between 12-0 (possible under Miller) and say 10-2 or 9-3 with Barrett,but looking for a bright side. If Miller returns for 2015,the offensive line has had a year to mature and jell and then Braxton Miller returns and the 2015 Buckeyes might be the top team in the land. Add to that,the year of experience for Barrett for 2016 and there are some things to be gained,although of course, one would rather see Miller going right now. A huge loss and setback for national title hopes and maybe even Big 10 hopes,but I wouldn't count this team quite,especially for Big 10 championships. Back later or from work with my take on the Hoyer vs Manziel battle in Cleveland. Sitting at the road office watching the Giants and Cubs late last night or rather watched a guy with a rake playing in the mud. The Cubs led 2-0 after four and an half innings when a downpour hit the friendly confines and the Chicago grounds crew couldn't get the tarp down for over ten minutes and flooded the field. The teams then endured a rain delay of well over four hours before the game was canceled and since the game had lasted four and a half innings (the minimum with the home team leading),it became official. When you consider that the Giants are in a pennant race,this becomes a bad joke on the game and the league office should allow the Giants appeal of the loss and allow the game to be a suspended game and finish the game at a later date (you could even say that it could be finished only if the game affects a playoff spot) right where the game left off. Weather in baseball is one of those things that cannot be controlled,but last night in Chicago was an event that could have been controlled and baseball needs to do the right thing. 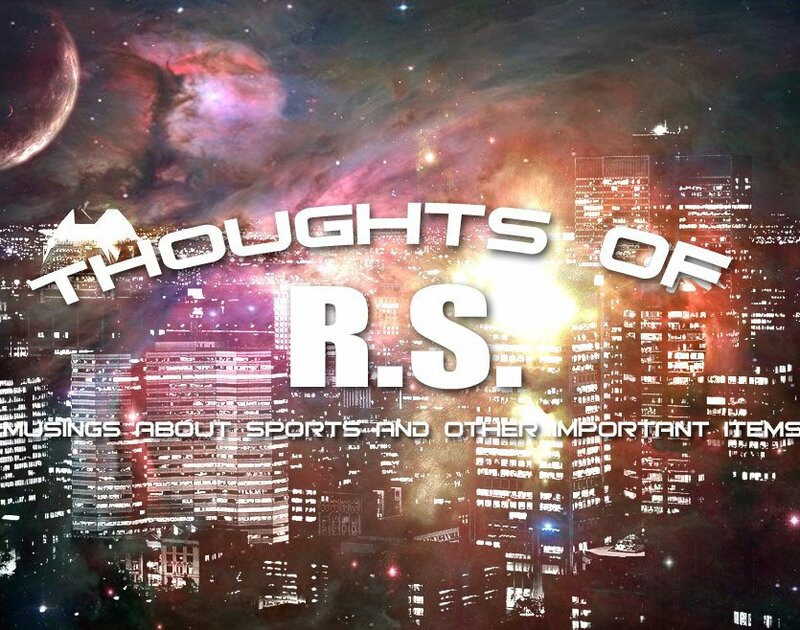 I don't really have much else to say other than to stay tuned at the end of the minor league season (less than two weeks away) as I have plenty to say about various things. Grantland takes a different spin on Japanese baseball and their scouting process as in how they decide what Americans to sign. It's a great take on how the Yokohama Bay Stars evaluate American talent and how they decide what "Gaijin" to bring over to Japan and how they might adjust to the Japanese game..
Another Grantland feature looks at former Wake Forest and Dallas Maverick standout Josh Howard and his attempt to get back into the league via the D league. Howard may have had his issues off the floor,but I always liked his game and was one of my favorite players to watch of his time. My friend Luke Erickson sent me an article from a website that I have never heard (Jacobin) and an author in Dan O'Sullivan who's work I was unfamiliar with as well. I am so glad that Luke sent it to me as "the story of Pro Wrestling is the story of American Capitalism" was one of the best reads that I have seen in quite a while. The article deals with the parallels of greed and money in the wrestling business through the last century and might be the best researched article on the business that I have read in years. Usually the press makes tons of factual errors in dealing with wrestling and this one didn't. Steven Goldman writes about the late Robin Williams and his long time wish to have Williams star as Casey Stengel in a film based on Goldman's book on Stengel. We wrap up with the CBC (Canadian Broadcasting Company) and their release of long time sportscasters Steve Armitage and Mark Lee. Editor's Note: A late squeeze-in of a National Geographic history of the Voyager progam. If you have any interest in NASA,space,etc and have a few minutes,take a look! The Cleveland Cavaliers continued their retooling for the 2014-15 season as the team managed to sign defensive specialist Shawn Marion to a contract for the veteran's minimum contract of 1.4 million on a one year deal. The team had already used all the various exceptions and Marion accepted the contract offer over that of the Indiana Pacers,who could go as high as over five million as the Pacers had an injury exception for the season after the horrific injury suffered by Paul George in the USA basketball scrimmage. The 36 year old Marion spent the last five years in Dallas with the Mavericks and was forced out by the Mavericks signing of Chandler Parsons in this off-season. Marion averaged 10 points and over six rebounds a game and still is one of the best defenders in the league despite his advanced age. Marion is an excellent addition mainly to his ability to defend power forwards,but especially small forwards on a team that will want to reduce LeBron James minutes wherever possible,. James looked to be the only player on the team (assuming that Andrew Wiggins is headed to Minnesota in the Kevin Love trade) that could play significant minutes at small forward,so the signing of Marion is an immediate upgrade at that position. Marion will also be able to play the four position with James on the floor adding to the team options at forward. Shawn Marion is not the run and jump force that he once was,but can still help in transition and even though his jumper is one of the uglier in the game,Marion is still decent enough offensively that he is not a hindrance on the offensive end of the floor. A very nice signing at a position of need and Shawn Marion should prove to be an excellent addition for the upcoming season. England's Kell Brook upset Shawn Porter to take Porter's IBF Welterweight title via majority decision in Carson,California. Brook used a superior jab and a surprisingly strong inside game to clearly outpoint Porter (at least on my card,which was 117-111) over the 12 round distance. It is easy to say this now that Porter has lost and especially since I picked him to win by KO,but watching the fight,one thing became clear-Porter's power is overrated against fighters that can punch hard enough to earn his respect. Porter's recent wins over Devon Alexander and Paulie Malignaggi both followed the blueprint,fighters that couldn't hurt Porter or match his punch output. Brook will likely look for a lucrative title defense against Amir Khan,likely in the UK,which would be a huge draw there. R.L.and I each earned zero points for the Brook win,but we would both earn a point from Omar Figueroa's knockout win over Daniel Estrada in round nine to keep his WBC 135 pound belt,just when things were looking bleak. A busted up and cut Figueroa came out for round nine with his corner wanting to stop the bout,figuring that their fighter was ahead on the cards. It turned out that he was,even though the fight was even on my card,and Figueroa dropped and then finished Estrada to end an exciting scrap. Both R.L. and I picked Figueroa by decision,so we each earned a point. R.L earned two points to my one as Anthony Dirrell lifted Sakio Bika's WBC Super Middleweight title via unanimous decision. R.L picked Dirrell by a unanimous nod,while I preferred Dirrell via split nod. I had Dirrell winning 117-110,but if not for a point deduction,the fight would be a majority win as one card had Dirrell winning by a point. It was a rematch of a draw between the two and followed a similar style of sloppy and dirty action from the first bout. The Boxing Challenge returns tonight with a three fight Showtime card from Carson,California.R.L.Malpica leads 56-54 at this point. WBC Super Middleweight Title.12 rds. After the golden age of heavyweights in the 1970's,it would have been easy to think that the excess of talented big men would continue into the new decade and the division would continue to flourish. The two that were thought of as the most talented of the bunch had lots of parallels in championship,yet disappointing careers. Both held the WBA belt ( the lesser of the two at the time due to Larry Holmes holding the WBC title),both had fast hands,both would lose to lesser fighters,both had a propensity for entering bouts out of shape and both would pass away early in life. Michael Dokes might have been the most talented of the group and had the best pedigree from the amateurs as he was the 1976 Olympic alternate in the heavyweight division. 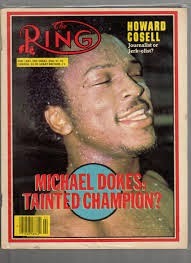 Dokes was quite talented as his hands were the fastest of the bunch and he was an underrated puncher as well. Dokes was a noted lover of the nightlife and didn't always come into fights in shape,which most notably backfired on him in a draw to undersized Ossie Ocasio in 1980. A rarely motivated Dokes smoked Ocasio in one round in a rematch two months later,but Dokes then continued to battle fringe contenders for the next two years with the exception of a majority decision win over Randall "Tex" Cobb as Dokes waited for the title shot that he was promised. Dokes had his choice of title shots and chose the path of least resistance in WBA champ Mike Weaver rather than the true champ in WBC beltholder Larry Holmes. Dokes stunned Weaver and the TV audience with a stoppage after 63 seconds that was most noted for a Dokes flurry and a WAY too premature ending with an unneeded ending by the referee. The public outcry was such that a rematch was ordered on a closed circuit broadcast that was touted as Night of the Heavyweights and was headlined by Larry Holmes-Tim Witherspoon. Had things bounced and both won impressively,there could have been a unification bout next. That wouldn't happen as Holmes struggled to a controversial split decision. Meanwhile,amid the uproar of the Holmes win saw Dokes fight in the second best action fight of his career in getting a draw against Weaver,that most had Weaver ahead in a close bout. Dokes didn't get the wakeup call as he was knocked out in a bout near his native Akron by Gerrie Coetzee in the tenth round and would then fight no bouts against top contenders for the next six years. Dokes is best remembered by the casual fan for his 1989 fight against Evander Holyfield,which is most noted for the action and secondly for being the first bout that is well remembered as a Showtime broadcast. The bout reestablished Dokes as a name after his 10 round TKO loss to Holyfield and he was able to parlay that into bouts for the next four years against young contenders and guys on the edge of contention. The most memorable of these was his fourth round KO loss of the hands of Razor Ruddock,which established Ruddock as a contender after nearly beheading a defenseless Dokes in the corner. Dokes then ripped off a nine bout winning streak over non-entities and two fringe contenders in Jose Ribalta and Jesse Ferguson in getting the nod for a title shot against Riddick Bowe. Bowe dispatched Dokes in one round and essentially ended Dokes career against world class opposition. Dokes would fight on for another few years against little known opposition before retiring in 1997. The ending for Dokes would not be a pleasant one as he spent nine years in prison for attacking his fiance' and he would pass away a few years later from liver cancer. I started this feature intending to cover several fighters in one post,cut it to two and decided as I wrote that this was so much fun that I think I am going to make this a recurring series! Thanks to my nephew Jeff for giving me the idea for the post that became a series. Look for a second installment soon! The laughter that comes from looking silly in the middle of change can be funny and yet often not,but the behind the scenes problem when you try to change yourself are more than you often know. Change also comes when our children move away as well. My life is different than it was on the day before Ryan moved out and when the day arrives that Rachel leaves home,my life will once again change. Although I miss sitting around and watching late night games with Ryan and shooting the bull,I've never been shy about telling the truth about the last year or so that he was here. The time was right for Ryan to leave the nest because as I've said "Ryan was ready to leave and I was ready to let him go"
Saying all of that,things still changed for me,but in such a positive way. Cherie and Rachel have each helped me move into a life that features more of a upbeat form and even though I still have my days (just ask them),I believe that I have developed into a different person over the last few years. Not just in who I am,but how I deal with things. Don't get me wrong,I still have a long way to run in dealing with things positively. I still get upset easily and I have issues in being able to let things go. When things bother me ,they tend to eat at me and I have real difficulty letting things roll off my back. I'll have friends tell me to just let it go or don't worry about it. I can't help it,I'm a worrier and things just get to me,but it isn't quite as bad as it used to be and in recent years,I've taken some small steps to tolerate things better. I'll give two examples during something that happened to me lately from the same event. I'm not going to get into specifics,but I read a biased account of an event from a person that I am not friendly with about a person that I was friends with. I sat down and prepared to write a scathing commentary about this guy on the board that he wrote on. I even wrote it and then decided to let it go. Small victory for this day. Another one came when a friend suddenly doesn't consider me one anymore on the above incident (I'm not the only one).I don't understand why and I want to know why and what has happened,but trying to let it go despite the hurt that I and the others involved feel. That's part of change too being able to live with the limitations of what you are as a person. Learning to live with yourself often can be more difficult than you can imagine,especially with the human foibles that we all personally have. Change also means having the insight into realizing that you are flawed as a person and accepting that there are things that need changing. I'm far from perfect on a good day,but if you truly want to change things about yourself,you have to be able handle the truth about yourself. Example-I've had my days of being pretty egocentric,yet I've never always known that. It took people that I care about and care about me to let me know that everything is not always about my likes and dislikes. I'm still working on that one (ha ha),but realizing that things had to change is half the battle and that isn't always an pleasant realization to come to. I've changed things about myself,my environment and how I treat people,but as I've told so many that I'm still a work in progress and have a long way to work on this canvas! Some things have changed in my life,others still need to have a few tweaks,but the carousel of life never stops. People will come and go and each of them bring a little something to your life that no one can. We all change to various degrees,it's just a matter of adjusting or making the commitment to be better. I've two other requests for topics and if there is no interesting news today,I'll be doing one of them tonight. The overhand right returns after a long hiatus with some observations from the world of boxing..
We'll start with a few words on the joke that was the Showtime/Golden Boy card from Brooklyn shortly,but I wanted to say thanks for the all nice emails,tweets and messages on Facebook about yesterday's post about my dad. It is always nice to have people like your work,but here I get a special kick out of people liking the non-sports posts. Thanks again for spreading the word on that for me,it was truly appreciated. As far as Dad goes,he managed to talk the hospital in releasing him today. It was a day earlier than they really wanted to,but he has a way about him sometimes that allows him to get his way. Now the wait is on for the return of the tests that will tell the tale of whether this is a short term issues that surgery has resolved or has the long term war just begun? The Showtime card from the Barclays Center in Brooklyn was simply put a sad joke on boxing. 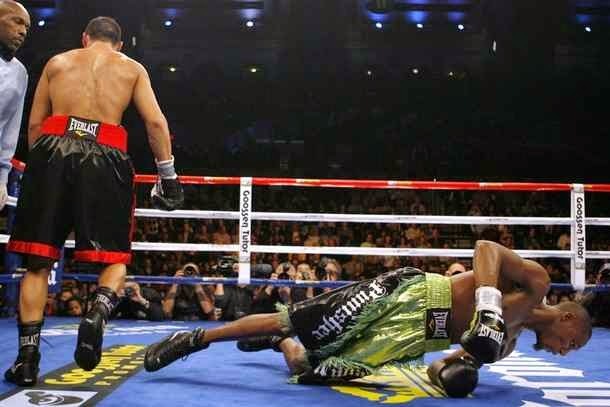 Danny Garcia's second round knockout over undersized and outgunned Rod Salka was a disgrace. Now first,allow me to say this,Non-title fights go back as far as I can remember and I vividly remember WBC Featherweight Champion Juan LaPorte dropping a decision to clubfighter Gerald Hayes in the mid 80's,so these aren't always gimmes,but Gerald Hayes was likely a top 25-30 fighter,so Hayes putting all together on one night could happen. Rod Salka on his best day wasn't top 100 and against the best junior welterweight in the world,you could see that this was a mismatch. Shame on Showtime for agreeing to this farce. The co-main was a little better,if only understandable as Lamont Peterson stopped Edgar Santana in the 10th to keep his IBF Jr.Welterweight belt. Santana,while being more qualified than Rod Salka,was still untested against world class fighters and it showed. I could live with this as a showcase bout for a Garcia-Peterson bout,if anyone was clamoring for that fight. Yes,Peterson owns the only belt that Garcia didn't,but his third round KO at the hands of Lucas Matthysse and the subsequent Matthysse close decision loss to Garcia devalued Peterson's title until he proved otherwise. The Santana win and his previous defense over the qualified Dierry Jean haven't quite done that,so I'm happy that Garcia-Peterson might happen to unify all the belts,but Garcia is the true champion and I'm not sure anyone is really excited about the bout. When premium cable (HBO and Showtime) show such dreck,they show a disrespect for the paying customer and hurt the game and their boxing program. HBO and Showtime customers pay for the programming that they provide and many (me included) have their channel just for boxing. To have such a card is disrespectful to their consumers and the sport. This card would have not been any better had it been televised on Fox Sports 1 (a GBP Partner),but it would have been understandable due to the lesser rights fees that would have been paid. We wrap up with a few words on the 32nd anniversary of the car wreck that cost the great Salvador Sanchez his life in the midst of a great 126 pound title reign. Sanchez's biggest win over Wilfredo Gomez is shown above,but the wreck cost boxing so much-a move up in weight that could have seen an eventual match vs the great Alexis Arguello,but especially the match that never was Sanchez and his nine defenses of the WBC belt against Panama's Eusebio Pedroza and his 19 defenses of the WBA title in the days of just two ruling organizations. What a great fighter and what a loss for our sport. 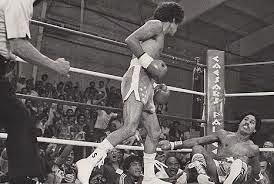 Look for a Forgotten Superstars down the road on Salvador Sanchez. Today was an interesting day for me and quite enlightening in some ways. Enlightening to the point of life changing. Well,it started by me turning down the chance to go to Aberdeen with Derreck and Brad. I would have liked to have gone,but I hadn't had a chance to go to see Dad in the hospital yet and I felt that I should stay close to home in case anyone (my mom and grandmother) needed me. My brother was at work and so Cherie,so I thought someone should be around if things were needed. But today,I realized something-my father is getting older and therefore I am too. The toughest guy I've ever met and the man that raised me complained that he was sick. The man that almost cut his finger off and reported to work anyway was saying that he wasn't well. Finally,he said he just didn't care about anything,one way or the other. It finally struck home that my father wasn't the imposing person of days gone by,rather he was just another not very well older person. I knew my dad had reached a certain age,but I had never thought of him as I saw him today. Dad had some heart issues a few years back,but he was still working,not retired and I hadn't gotten as close to him as I am today,so seeing him in the hospital for the first time didn't hit home as this time did. It's sometimes a wakeup call when you realize your parents are mortal and age like everyone else. If they are aging,that means you are too and that can be more of a realization than muscle pulls and backaches ever bring to the table. Time wins over all of us,but it's still stunning when it actually hits home. Well,in one way,nothing has changed-I'm still a middle aged man with a father that is getting even older,but in one way,yesterday changed me dramatically. I realized my father is human and as silly as it sounds,I might have never truly realized that before. When you put people on the pedestal for whatever reason (and the reasons do vary) it's jarring to realize that they are people with problems and issues like anyone else. The passing of Robin Williams should show an example of that. Dad was grumpy,growling, wishing people would leave him alone and even told me that he wasn't going to be good company because of the pain. He complained the hospital television sucked (No MLB or MASN,so no games) and we talked a little about the terrific end to the PGA Tournament "It wasn't terrific to me,I don't like McElroy"
Both of us are Phil Mickelson fans,so we chatted a bit about Phil's future and how many more chances at majors he might have before he again said he wasn't going to be good company because he felt sick. I told him that I'd leave whenever he wished,but for now,I just wanted to be near,if he needed me. I silently read a book (those that know me know that a book always accompanies me on nearly all occasions) as I sat near a window with the shade pulled down. I bet in 45 minutes,those initial words were all that we spoke until my mom came in. It didn't take him long to wake up then or to resume his grumbling as their bickering volleyed back and forth,so I left shortly thereafter,the silence broken. The drive home was filled with some of the thoughts that I'm typing now,but even more thoughts too. What happens when this is over? What happens when it's me in the bed and Ryan and Rachel looking at me that way? Do my children look at me in the manner that I always looked at him? Do they think I'm human? The questions really made me wonder and only a few existed that I had answers for. One cannot really know what someone else thinks for the most part,Can they? Well,I'll continue the process of being a better son and family member. I've come a long way in the last two years,I think anyway, and I want to continue to grow,but I also want to get to know this fellow that I visited in the hospital even better. You see,now he's a person just like me and that might open things up more than I could have imagined. All the autographs in the world couldn't give me the realization that I discovered and yesterday would have been a good time (I still don't care much about Cal Ripken :) with my friends,but I did just fine without a single drop of ink hitting a baseball card. Some things are simply more important. IFL Weekend (Yes,Caps needed) is always the best weekend of the year for me. Not only does this weekend mean the beginning of the football season,but it means a non-stop 48 hour frenzy of hanging with my buddies and spending time with my oldest friends. Battlin' Bob,Corey,Greg,Jeff and Ryan have been the core friends of mine for years and even though I've made great friends in the graphing world,you can never get away from the friends that know you best. Derreck,Brad,Kendall,Bill,Tracy and Mike have all become terrific friends and I have a great time with them,but there is always a special bond with your original friends. Think about a close knit group of college buddies or childhood friends,they may come and go from your life,but when you see each other,it seems like you are able to seamlessly move right back in form. It's not that it's always better friends etc,it's just the people that know you longest and have more memories of you than anyone else. I may spend more time on the graphing circuit in the summer now than with the IFL guys and I'm sure that occasionally they might feel neglected,but they should never feel shifted aside for the other group. I really wish that I could get the two groups to interact more,but things might be best as they are-with plenty of good friends on both sides. We finally accomplished the next step in the league this year as we entered year 15 of the history books-the move that I've always wanted- holding the draft in a setting that befits it-a hotel conference room. Lots of space to spread out, places to go for our smoking members and lobby space to get away for a private trade negotiation-in other words,it has that baseball winter meetings feel that I've always wanted for the league. It wasn't universally loved by everyone,especially when it meant tossing in more bucks to the league,but once you walked into the room and saw everything,it changed quickly! I know I enjoyed my league hosting the draft and Corey enjoyed his many years as well,but as the league transitioned into more local owners,the time of having the draft in an owner's home had passed and it was time for a new page in the annuals of the IFL. I'm not going to bore you with details of who did what and when at the draft. I've always thought that fantasy sports leagues rank right there with pictures of children/grandchildren and pets as things that are terrific for the people involved,but a terrible bore for everyone else! What I will say is this-a great time with one's pals and I think this is the way that it will be for quite a while,I'd tell you about it,but I might have to look at a cat picture in return! The Sunday after the draft is a day for league members and other friends of mine to bring their wives and families to enjoy great food,play some "big ball" (remember this post?) and of course talk IFL. One trade did get done on this day that usually just sees talk,so that was pretty great and the big ball game was fun despite a 6-5 loss. I didn't pitch for the first time ever,I messed up my left calf running through a thunderstorm at the Muni last month and it really hasn't healed totally since. As I am gradually becoming old and infirm,I need to take better care of myself,so I settled for playing first,although the old man still dove and rolled on the ground to make a nice play in the field (lefthanded,mind you),so the mind is still willing even if the body isn't always able to respond in kind. I missed a few of my friends this year that couldn't make it,but my mom and dad most of all. Mom makes my favorite potato salad in the world,but my dad is in the hospital right now and mom cannot drive yet,so all things considered they sat this one out. They were missed though and I'm hoping that they will be back next year! All and all,IFL Weekend is a getting back to basics weekend,where we put things right with our friends,have a great time and act young again for a weekend. I think Battlin' Bob put it best when he said "We really need to get off our asses and do this more than once or twice a year getting together". Bob's right and we have already planned to have fun as a group for the opening day of the NFL season! Thanks again to all the owners,helpers (Corey's mom Chris especially),wives and everyone that help make this weekend as great as it is! Different things have arisen in the hobby that I have so much fun in and suddenly I find myself questioning a future in the hobby. I'm not going to get into things in detail,but one of my close friends is upset and therefore I'm upset. Every hobby has its issues,if you do something socially,these things can happen,but when it starts to bother the friends that you have made,then it's time to reevaluate. I thought about the bad things of our hobby. People that are rude,have a negative opinion about what we do,make things tougher on getting things finished etc are all bad things. And some of the hobby has a certain degree of bad acting ranging from the business of sports all the way to the interaction between collectors,but I suppose any hobby that involves other people has some of that. When you think of that,it's easy to feel disillusioned. However,then you have to measure the good and there's where things clear up. I have made so many great friends,seen so many things,met so many people that I never would have before and gotten to do more than watch games on my couch (anything that gets a fat man moving is a good thing) and none of those would have happened without baseball and this crazy hobby. I coached for ten years and I feel overall that it was a positive experience (Bet the lovely Cherie doesn't quite see it that way),I made one of my best friends that way,but it had so much negative parts too. I don't look at graphing that way. Other than the occasional idiot (and more often than not,they are amusing more than infuriating),I don't have a ton of negative things to write about. All things considered,it's a pretty neat thing that I participate in. 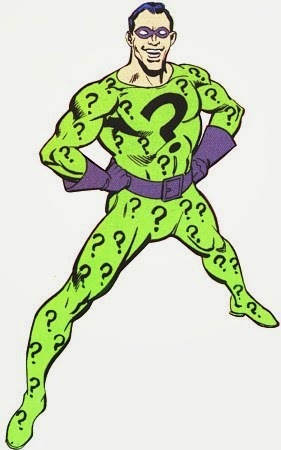 Time for a little feature that we call Q and A in a very imaginatively name for the feature. It basically takes the occasional question that we get in an email or a conversation and I get to stretch it into a post! Why do you never seem to be at work? Well,it does seem that way at times,but I work plenty. I just happen to work at an agency that allows to use one's personal leave as they see fit. What happened to some of the trips that you planned for graphing this year? This one is some of my own doing and the other was a calculated decision. I decided to pass on the LPGA this year because I really didn't want to do it alone,since it was new to me and that is what it looked like it was going to be. I decided to roll that money into New Orleans Saints training camp and that was a go until two things happened. One was I was told of the restrictions doing the camp (no bags,nothing that was concealed even to carry items in) and that a meet the team session was the way to go. The problem was that was not announced until late and I wasn't able to get to go on that date. Then I was in the 11 day work run along with other commitments and I just decided to wait until next year since the Saints have signed a three year deal to open camp in West Virginia. I hope to do both events next year! What's with the sudden interest in golf? I wouldn't say that it's sudden,but I would say that it has grown. I've always said that major tournament golf ranks near the top of my must watch television list (especially the Masters),but I've grown quite fond of the LPGA in the last few years,especially on weeks that my favorite male players are taking the week off of the PGA and Champions tour. The best thing about watching golf (like baseball) is that you can watch and do other things (like work on this for example) without missing a lot of the telecast. Who do you like for the Browns starting QB job-Brian Hoyer or Johnny Manziel? This is my second most asked question. Hoyer deserves the chance to start unless Manziel beats him out decisively. Do you forgive LeBron James for leaving now that he is back? My most asked question by far! I'll forget,if he spends the rest of his career with the Wine and Gold. He made a decision and he regretted it,despite winning those titles with Miami. 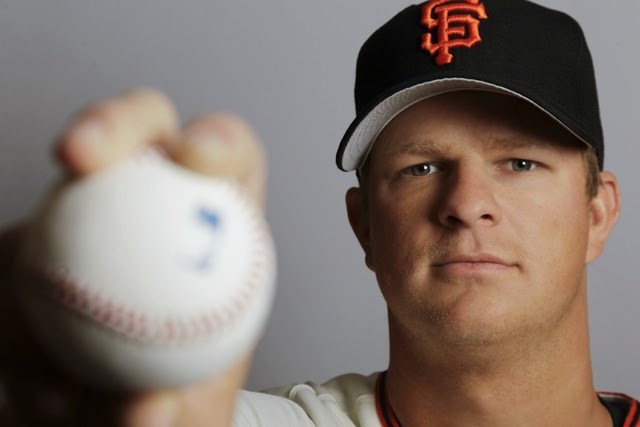 Matt Cain will be missed by both the San Francisco Giants and the Akron Rubber Ducks (my fantasy league team) as Cain will miss the remainder of the 2014 season with elbow surgery. Cain has bone chips in his elbow that need to be cleaned up and have affected his numbers (2-7 4.18 ERA) from their normal statistics. The good news is that bone chips are an easier operation than other elbow injuries and the recovery time is expected to be just three months,so the righthander should be ready to go for the 2015 spring training season. Cain really hadn't pitched much worse than 2013 (8-10 4.00 ERA),but the elbow issues had taken their toll on Cain's much vaunted durability and as a result ended the season. The big question becomes what will Brian Sabean and the Giants and do about the sudden hole in the rotation on a team that already is not a great hitting team with other holes to fill? With a farm system that has little immediate help available to the point of bringing up two players from AA Richmond (Matt Duffy and Jarrett Parker) rather than AAA Fresno,will the Giants play the hand and see how it falls? Or will Sabean roll out the one top trading chip he has in Richmond righty Kyle Crick in order for reinforcements for the present? That didn't work out so well in moving Zach Wheeler (boy,could they use him now!) for Carlos Beltran,but worked out very well in adding Hunter Pence from the Phillies. If it was me,unless it was a player that is signed for at least next season.I'd stand pat in making big deals. The picture says it all as Ryan and I drove over four hours to reach Jamestown,New York and then watched as a massive thunderstorm smashed the area just before the gates opened. The net result was the Lowell Spinners and Jamestown Jammers were rained out and we were on our way home. The company was good though and I had a blast spending time with Ryan and I hope he did as well. 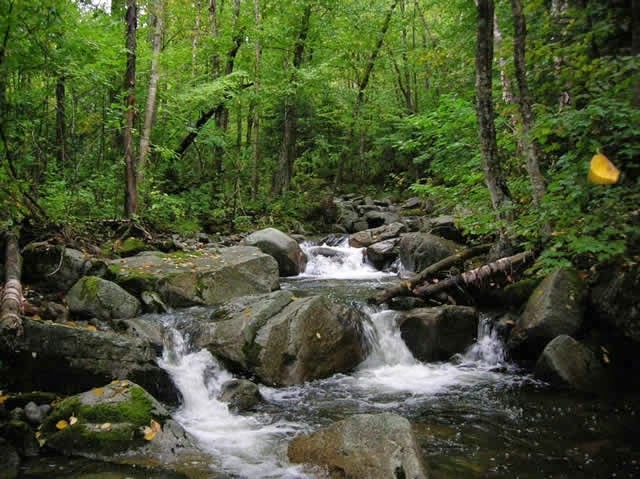 The scenery was interesting as we wound our way through various forests and small villages that I've never been to before,but nothing overtly stimulating. Jamestown didn't seem to have much interest in their team as we drove through various (though not all) part of town,I didn't see one Jammers sign,ad etc. It was like the team didn't even exist. Even the Suns do more than that! Before the rain started about thirty mins before the gates opened,we tried to find something to do and just continued to come up empty on the places even miles away. No Wal-Marts,Targets etc and not even tons of places to grab a drink to pass the time. There was a Tim Horton's as Ryan Siebert tipped me off on,but otherwise almost desolate. I might not pick on dull Hagerstown for a little while! We pulled into the parking lot and saw about six cars,no line (as in zero people),neither of the two ticket windows open,just three employees standing inside the gates. They must have had the radar ready because the sky opened and you saw Lowell players running for the clubhouse. After sitting in the car as the rain pummeled the car,things remained status quo and when it got to five of six,we walked to the gates-none open,so we walked to the side of the field and walked into the office to ask the status of the game. The game hadn't been called yet,so we are escorted to the team store,which had terrific prices. I bought a hat and the girls at home each a shirt and talked about the move of the team. The fellow that was there with us told us that it wasn't a done deal and that it could be the Jammers or Batavia or Auburn to move to Morgantown WV for the 2015 season. I still think it will be the Jammers,but I understand why they didn't acknowledge anything. After all,Hagerstown came right out and said goodbye and look at their wonderful attendance numbers. Russell Dietrick Stadium is on the campus of Jamestown Community College and even though I didn't get to see the game,I liked the covered grandstand and it was sort of a cross between Hagerstown's Muni (the cover) and the more oval shaped grandstand of the Potomac stadium. It also made me think a little of Bowman Field in Williamsport PA where the locker rooms are part of the outer ring and the players have to cross the concourse by the fans to reach the field. I bet I could have cleaned up as far as graphing goes in that alignment! The team allowed us to walk around the stadium to take pictures and here was the one big regret of the day for me was-When we asked to go to the team store,I didn't bring my briefcase because I figured I'd have to get tickets to get back in for the game. When we walked up to the grandstand almost the entire team of Lowell was sitting in the stands. I could have gotten almost all my cards signed then and there. I spoke to a few of them and asked if any had played for Greenville and saw the Muni. One spoke up and said he had and said "pretty comparable to here". After about five minutes,the guys must have gotten a text that said game called,because they all leaped up and went back to the locker room. It was still raining and the rain intensified as the players waited for the bus and that helped my decision to not ask them to sign as they waited. I just didn't want to gamble on rain messing the cards up. Long drive home filled with rain and good conversation,although we drove by the Altoona park,who must have avoided the rain and managed to get their game in against Richmond. It's too bad that the New York/Penn league is moving out of the small city/old time ballpark situations. Towns like Oneonta NY,Jamestown and Batavia NY simply aren't big enough towns to keep teams anymore without building new parks and the desire to do so (or just as likely the money) are not enough to keep those towns baseball heritage alive. So we move onto bigger population areas with brand new (and nice) stadiums that make more money,which is understandable,but I have to feel that we are losing something for days gone by. The rookie and short season leagues are made for small towns to help the youngest players get their feet wet as pros,I would hate to totally lose that altogether in the quest for big profits. I didn't see one pitch thrown on a day devoted to baseball,but I still had a great time spending the day with Ryan. Nine hours in the car round trip seems like a long time on paper,but it was not in real time. It was like a step back in time as we talked,laughed,looked back and yet forward on the same day. I'll have some more pictures as I get them from Ryan to add to this post. I know this might not be everyone's interest,but it's a slow day before I prepare for a road trip,so today's post is going to a light and short one. I like cooking in cast iron and I think the cast iron pan is the most versatile one that I know of. You can fry,deep fry (in a large dutch oven),grill (with a cast iron pan with raised ridges for the grill marks),bake etc. I cannot think of a kitchen task that heats food in some way that cast iron cookware cannot perform and perform well. Stick on it on a stove top,set on a grill or in the oven and cast iron takes care of business. 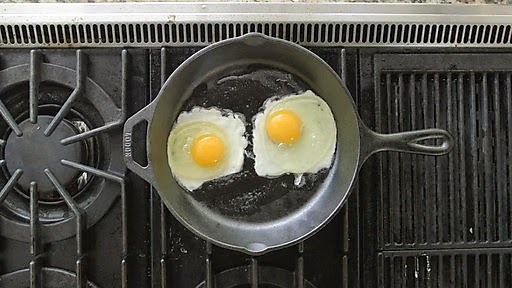 Cast iron retains heat so much better than standard cookware and things just plain taste better too! Our chili never tastes as good as it does when we whip it up on our dutch oven! I also am a huge fan of sausages and hot dogs in cast iron,it adds such crispness to the casings and the snap that you expect from a good hot dog and don't get me started on bacon and eggs! You can also find about any type of cookware shape and size too. From skillets to hibachi grills to baking pans,cast iron just adds that zip to whatever is cooked in it! And the additional value to cast iron? As long as you care for it and don't allow it to get rusty,it's the type of cookware that you can easily pass down to your children and grandchildren! Plus,even if it does get rusty,a few easy maneuvers and you can bring what seems to be a dead pan back to life for future uses! Lodge is the name brand in the field and with the exception of the first pan that I ever bought,I wouldn't go elsewhere. I couldn't bear to toss the first pan that we bought,but the Lodge items are so superior that I rarely use it. Cherie will be getting another piece sometime for her Lodge collection (SHH,don't tell her) and I have a few ideas. She liked the original so much that when Corey and I were in Tennessee,I saw the Lodge factory outlet and I had to buy her a set of pans! In hindsight,had I known more then,I could have spent even more on Lodge pans. If I am ever able to return to Tennessee for another Smokies game,I can almost promise that I'll be there buying more Lodge! I even bought Ryan a set of Lodge pans for Christmas one year and although I don't know how much he uses them now,they will be ready when he needs them and I plan on buying Rachel a set sometime for her eventual departure (sniffle). Lodge cookware not only does a great job in its job,it also adds a little nostalgia to time in the kitchen. My grandparents used cast iron a lot and I'm sure it traces far further than that,but I can still smell and hear the aromas and the pop sailing through the air during times there. We start the cleaning of the inbox with an article on Andrew Wiggins on the reality of being in the pro game from Fox Sports. I've been desperately hoping against hope that that the Cavaliers will be able to hold onto Wiggins in the prospective Kevin Love trade because I love his game. I still believe that the Cavaliers would have been better served waiting a little while to gain Kevin Love and I also still believe that the asking price would have dropped over time. The Oklahoma City Thunder are trying an unusual end around the NBA rules with an attempt to "draft and stash" Stanford forward Josh Husetis in the D-League. The catch is that Huestis has to refuse his NBA mandated rookie slot contract of over a million dollars to take far less to play in the D-League. As in 25,000 dollars to play the season there. The Thunder gambles that Huestis doesn't sign it and takes him at his word that he doesn't,Huestis gambles that he can develop his game there and make up those earnings later with a more improved game. I rarely link to Herald-Mail articles,but this one that discusses why the Hagerstown Suns are drawing so poorly is worth a look. The article talks to fans,although the author didn't do a good job of talking to fans that are regulars,about their thoughts on why the Suns attendance is lousy. There are plenty of excuses by various people quoted in the article,but two things that are only lightly touched and yet loom as the two largest reasons for this problem-the decrepit state of the stadium and that fact that the Suns have been so transparent about heading out of town. Grantland writes about the seemingly revived Tim Lincecum and makes a case that the Giant pitcher has had various issues that accumulated into the decline and perhaps the return. It appears to be a book long on characters known and less known and I'm considering getting it sometime in the future. Former Indian rookie of the year Joe Charboneau is pictured on the cover from his year with the Chattanooga Lookouts in a tuxedo while sipping champagne at a table placed on the field. We wrap up with a link to the Moon. More specifically what the landing spots of the Apollo missions look like today from the Lunar Reconnaissance Orbiter. What they look like is just about like things looked when the Apollo astronauts left after their mission. Consider things cleaned out for a while-Back for more next time!